Kim Jong Un visits the Pyongyang Bio-technical Institute in 2015. Photo: Rodong Sinmun. While the use of biological weapons (BW) can have great consequences and any state having them in their military arsenal is a major international concern, assessments are made about the extent and sophistication of North Korean BW capabilities that are based on very little information. A recent news story reviewing the danger that North Korea’s biological weapons capabilities may pose is a case in point. One former government official quoted in the report opined that North Korea is “Far more likely to use biological weapons than nuclear ones” and that “the program is advanced, underestimated and highly lethal.” These assertions may be true, but it is virtually impossible to know given North Korea’s secrecy and its track record of hiding military research and production facilities. US government unclassified statements over the years about North Korea’s BW capabilities do not clarify our understanding. A threat assessment by the Central Intelligence Agency (CIA) in 1997 indicated that North Korea was “capable of supporting a limited [biological weapons] effort.” Eight years later, in 2005, then CIA Director Porter Goss reported that “North Korea has active [chemical weapons] and [biological weapons] programs and probably has chemical and possibly biological weapons ready for use. However, since 2014, the US Intelligence Community’s unclassified assessments on BW have dropped North Korea from the list of suspect programs. In 2014, US Director of National Intelligence (DNI) James Clapper only singled out Syria as having “some elements” of a biological warfare program that had “advanced beyond the research and development stage.” One year later, Clapper cited no state BW weapons programs of concern. The current DNI, Daniel Coats, also failed to mention any biological programs in his first World Wide Threat (WWT) testimony before Congress in May 2017. In his 2018 WWT statement, he said “North Korea has a longstanding BW capability and biotechnology infrastructure that could support a BW program.” Coats does not say “North Korea has one of the most robust offensive bioweapons programs on the earth,” as John Bolton did in a 2002 speech. With much less bravado, Coats uses language that describes what could be the case in a very large number of countries, including North Korea. Defectors are also important but not definitive sources of information; their reports present a worrisome picture, but many are based on indirect or secondhand knowledge, repeat what has appeared in the open press, or are implausible. During 2003–04 and again in 2009, several defectors claimed that North Korea tested poisonous materials on political prisoners. However, these charges refer to the use of chemicals on humans and not biological agents. In 2014, a group of scientists, Korea experts and human rights advocates attempted to verify these claims by speaking with South Koreans working with the North Koreans who made these allegations. The group was unable to corroborate the allegations and discovered inaccuracies discrediting the defectors’ claims. There are reports that recent defectors have been vaccinated for smallpox and anthrax, which has led some to assert that the regime has weaponized these agents and is prepared to use them. While we cannot not rule out the possibility, it is also possible that such vaccinations might be a routine practice of North Korea’s defensive program. The Soviet Union, Warsaw Pact nations and Iraq all vaccinated their forces as standard practice. The US military vaccinates its troops before deploying them to potential war zones. North Korean propaganda has claimed since 1951 that the US attacked it with BW during the Korean War. These claims lack credible evidence and have been discredited by Soviet and Chinese documents. While some North Korean leaders may have known the truth about these allegations, others may not have. Continuing to depict the US as an evil power that may invade using all manner of terrible weapons fits with North Korea propaganda and inspires the North Korean people to prepare for it. North Korea also justifies its fear of other states’ biological capabilities by citing how in 2015 the US military acknowledged that it mistakenly sent live anthrax cultures to an American military base in South Korea. Shortly after this mishap, Kim Jong Un visited Pyongyang Bio-technical Institute. Photographic images from Kim’s 2015 visit do not exhibit the military security, safety precautions, and other common measures associated with facilities that could produce biological weapons. Biological weapons production facilities are not places one just strolls around without wearing protective gear. Furthermore, none of the countries that revealed and decommissioned their BW programs ever housed them in dual-use facilities. They were always located in heavily guarded military facilities. The Kim regime might have arranged the visit to sow concern about its potential capabilities and serve as a deterrent. What the images do reveal is that the regime evaded export sanction restrictions and obtained equipment that could be used perniciously. Even if North Korea has lab samples of smallpox and some of the other pathogens previously described, weaponizing them is a formidable scientific and engineering challenge. Assessments by the South Korean government estimate that North Korea has a dozen biological agents—if true, it is the exact number of BW agents the US produced and just one short of what the former Soviet Union produced. The US and the Soviet Union spent huge sums of money on their BW programs over several decades, experiencing tremendous difficulties including accidents that resulted in some deaths. Despite its progress in various scientific domains, North Korea is unlikely to have matched the efforts of Cold War superpowers at the same time it was developing nuclear weapons and missile capabilities to deliver them. Moreover, smallpox was eradicated in 1979 and only the US and Russia store and handle the disease under World Health Organization supervision. The assumption of the international community has been that these are the only two remaining repositories of smallpox. A recent report identifying scientific articles North Korean scientists co-authored with foreign scientists raised concern that the Kim regime is taking advantage of international scientific collaboration to boost its technological capabilities and in turn aid its BW programs. The report rightly raises concerns that some of these collaborative efforts violate various international sanctions. It also provides the basis for valuable follow-up research with the foreign co-authors to see how they perceived the implications of the collaboration. 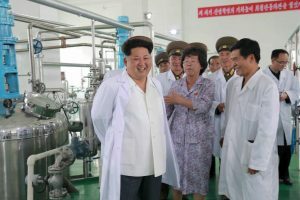 This report represents a much more rigorous approach to assessing North Korean capabilities than the statement by one North Korea watcher who opined that North Korea scientists must be experimenting “with gene editing that could enhance bacteria and viruses…because scientists love to tinker.” Again, while this may be possible, more evidence is needed than just the notion that scientists love to tinker. North Korea has publicly stated that it is a member of the Biological Weapons Convention when challenged about its biological weapons capabilities and has asserted that it “does not develop, produce and stockpile chemical weapons and opposes chemical weapons themselves,” reflecting at least some acknowledgment that these are taboo weapons. Until there is greater transparency, however, on the regime’s dual-use facilities, its claims will be suspect. Although North Korea may not be willing to engage in any dialogue about its actual or latent BW, it might be willing to engage in some confidence building exchanges on medical, agricultural, and other issues that might provide some view on its dual-use facilities that create suspicions. Embarking upon scientific and medical exchanges on clear civilian issues might build important relationships that lead to additional transparency and understanding of the capabilities in biological science. Additionally, as a corollary to the dialogue on North Korea’s nuclear and missile programs, the US and South Korea could invite North Korea to join in a pledge never to use biological weapons. All three countries are parties to the international convention banning biological weapons (the BWC), so, in theory, this should be a diplomatic opportunity to get the three nations to reaffirm their commitment to the BWC. A few attempts to further transparency into North Korea’s biological activities could contribute to the goal of gaining more insight on whether it is complying with the terms of the BWC. If they have a clandestine biological program, such efforts may cause them to halt or dismantle it. As to whether and to what extent North Korea has a clandestine biological weapons program we will not know unless there is more transparency. Without more insight, the US and its allies may risk repeating some of the mistakes made about Iraq’s weapons of mass destruction. North Korea perceives itself as being on a constant war footing, has engaged in aggressive actions and weapons development programs, treats many of its people inhumanely and is a secretive state. Given how the regime has brutalized its people and inflicted violence on its opponents, human testing is imaginable and should be investigated. Yet, until there is more evidence, uncorroborated reports are not a sound basis for asserting North Korea has produced biological weapons. Does North Korea have infrastructure that could be used for biological weapons? Yes. Do we have clear evidence that it has produced and stockpiled these weapons and has nefarious ambitions? The best one can say is that some North Korea watchers fear that they do but the available open source evidence it is not so clear. As one scholar noted in a historical review of state biological weapons programs “Intelligence assessments of foreign BW programs often have been wrong, sometimes overestimating, sometimes underestimating, and sometimes missing them altogether.” Hence, DNI Coats’ cautious language in his most recent Worldwide Threat Assessment is by no means a “slam dunk” moment. Elisa D. Harris, “Threat Reduction and North Korea’s CBW Programs,” The Nonproliferation Review, (Fall–Winter 2004): 91. Bruce Bennett, “The Challenge of North Korean Biological Weapons,” testimony presented before the House of Representatives Armed Services Committee on Intelligence, Emerging Threats and Capabilities, RAND, October 11, 2013, https://www.rand.org/pubs/testimonies/CT401.html. See also, Joseph S. Bermudez, Jr., “North Korea’s Chemical Warfare Capabilities,” 38 North, October 10, 2013, http://www.38north.org/2013/10/jbermudez101013. Author communication with expert group leader and review of their internal report, January 2019. Sofia Lotto Persio, “North Korean Soldier had ‘Anthrax Antibodies,’ Raising Concerns Over Pyongyang’s Biological Weapons Plans,” Newsweek, December 27, 2017, http://www.newsweek.com/north-korean-soldier-who-defected-may-have-been-vaccinated-against-anthrax-759919. See also, Patrick Knox, “War and Pestilence: Defected North Korean soldier ‘vaccinated’ against Anthrax amid fears Kim Jong-un plans to use bio-Weapons to spread lethal infectious disease,” The Sun, December 26, 2017, https://www.thesun.co.uk/news/5213774/defected-north-korea-soldier-vaccinated-anthrax-kim-jong-un-bio-weapons/; and Emily Baumgaertner and William J. Broad, “North Korea’s Less-Known Military Threat: Biological Weapons,” New York Times, January 15, 2019, https://www.nytimes.com/2019/01/15/science/north-korea-biological-weapons.html. Sara Reardon, “US military accidently ships live anthrax to labs,” Nature, May 28, 2015, https://www.nature.com/news/us-military-accidentally-ships-live-anthrax-to-labs-1.17653. See also, Patrick Tucker, “This is Why The Army Sent Anthrax to South Korea, Australia, and 11 States,” Defense One, May 29, 2015, http://www.defenseone.com/technology/2015/05/why-army-sent-anthrax-south-korea/114094/; and Barbara Starr, “Army may have shipped live anthrax to Australia, CNN, May 29, 2015, https://www.cnn.com/2015/05/27/politics/live-anthrax-us-military-sent-inadvertently/index.html. W. Seth Carus, “A century of biological-weapons programs (1915-2015): reviewing evidence,” The Nonproliferation Review, 24, no. 1-2 (2017): 138. Carus’ article on the history of state BW programs has a table referencing eight different sources assessing countries suspected of having biological weapons. The sources range from a DOD report, two different US congressional reports, four independent scholars and one individual US senator. Six of the eight sources suggest North Korea possesses BW, one suggests that it is probable, and one does not indicate it as a possessor.